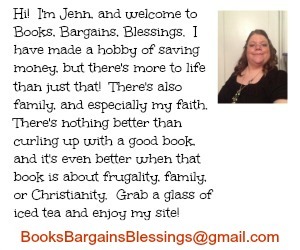 If you have been following my blog for any time, you know that I love a good bargain. I have been using coupons for nearly a quarter of a century -- since I was in my teens! But today I am going to talk about shopping at grocery outlets. I am fortunate enough to have one about 20 minutes from me, and a different one, which I try to visit a couple times a year just two hours from me. There are other things I do in that town, so it's not just a trip to visit the outlet, but the car sure does come back filled! 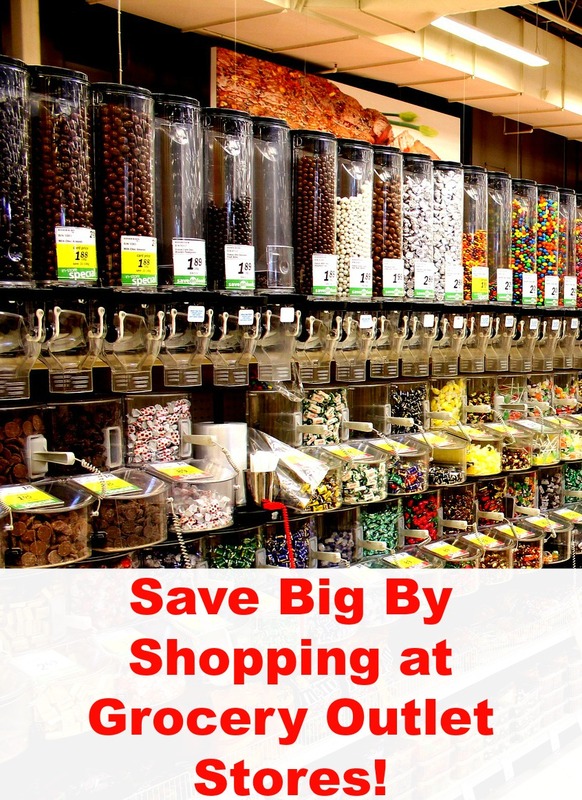 Grocery outlets usually don't accept coupons, but that's okay because many times you can get items as cheap if not cheaper than double coupons. The most unfortunate part of outlets is if they run out of something, they might not get it back in stock. So if you see your favorite cereal there get as much as you will use before it goes stale. Reading the packages is a must! While there are good deals to be had, you have to watch the "best by", "sell by" and "use by" dates. Just because something is outdated doesn't mean it's not safe to eat. Many times the best by and sell by dates are well in advance of when the product actually goes bad. Of course, you want to be smart about this because if something is dated a couple years ago, you don't want to buy it! However, if you are willing to use certain things beyond the sell by dates, you can get some amazing deals. Recently I purchased boxes of Quaker Instant Oatmeal for 50 cents a box. That's eight breakfasts for under seven cents each. Yeah, some of it was Pumpkin Spice, a seasonal flavor "out of season", but still in date. Many times the only place to find discontinued items is at a grocery outlet. I have actually bought a few discontinued items at the store and come home and put it on eBay and made more than enough to pay for my entire shopping trip. This can vary from store to store. Remember that if you repackage grains, such as rice and pasta, they can last a long time, so no need to be too particular on these. I actually purchased a Keurig for myself after wandering the aisles of our local grocery outlet and seeing things like boxes of Starbucks Cinnamon Dolce K-Cups for under $5 a box. So be warned the same could happen to you. I got a great deal on my Keurig and only paid $35 for it, but now I'm hooked on buying coffee at the grocery outlet. Another area I have to watch my spending in the section is the snack and candy area. Our local store is the only place other than Israel I have ever seen Bamba peanut snacks for sale. These are like cheese puffs, but are peanut flavored. There is always something unique in the snack and candy area and it's hard to remember that I don't need the extra calories! Sometimes, though, I will find things like Gluten Free snack crackers for under a dollar. Many times I love the organic and gluten free items, and I will usually pick myself up a treat of crackers, because, after all, it's better than buying a big bag of creme pumpkins left over from Halloween, even if they are a quarter, right? Our local grocery outlet will sell a box of groceries for $5. I have purchased one, but was disappointed with it. Many of the canned items were so dented I wouldn't use them. Many times these big banana boxes contain things that for whatever reason cannot go on the floor (cereal in a bag but missing the box, damaged packages, etc.) I know some people have gotten great boxes but the only one I purchased I didn't feel was worth it. 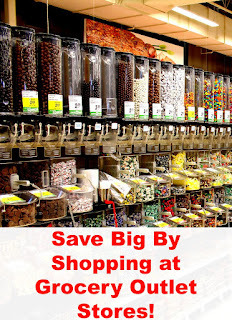 So there are big savings to be had by shopping at a grocery outlet and I invite you to give it a try and let me know how you do! You can find a list of grocery outlets here.